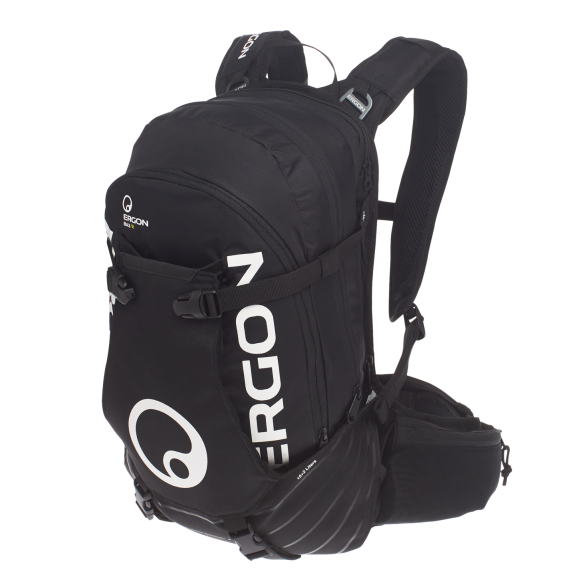 The lightweight companion for extended day trips with 10 +1,5 liters of volume (expansion via zipper). 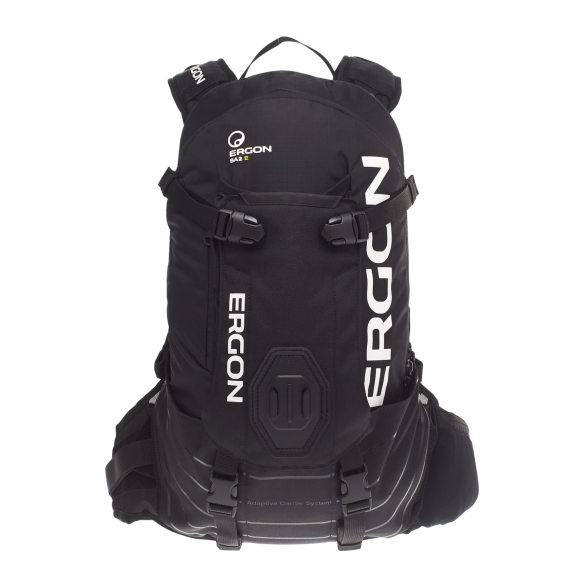 Thanks to the 4-way adjustable „Adaptive Carrier System“, featuring a loadcompression principle and a ﬂexible alloy sub-frame (vertical and horizontal), the backpack can be precisely adapted to each rider’s anatomy. This way all your equipment is held close to the torso and can be transported wiggle-free. 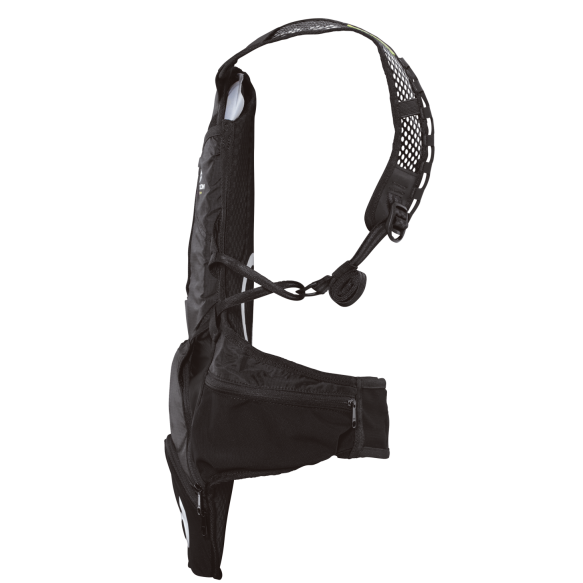 The wide and highly breathable hip belt distributes the load comfortably and puts less strain on the shoulders. 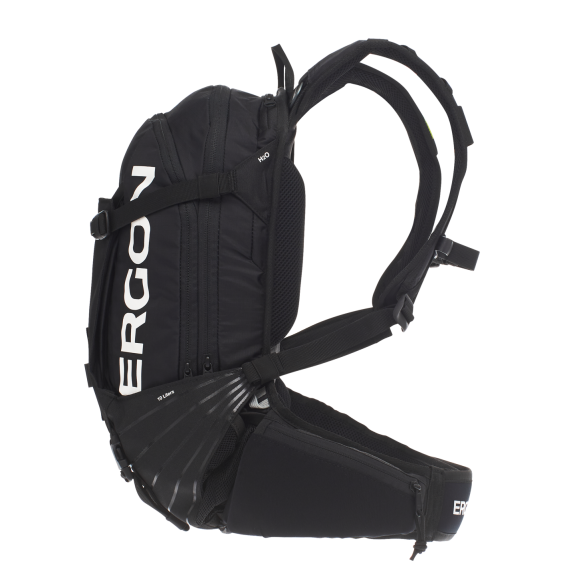 The BX2 Evo features 3D-Spacer-Mesh at all body-contact points and mesh shoulder-straps, poviding maximum breathability. 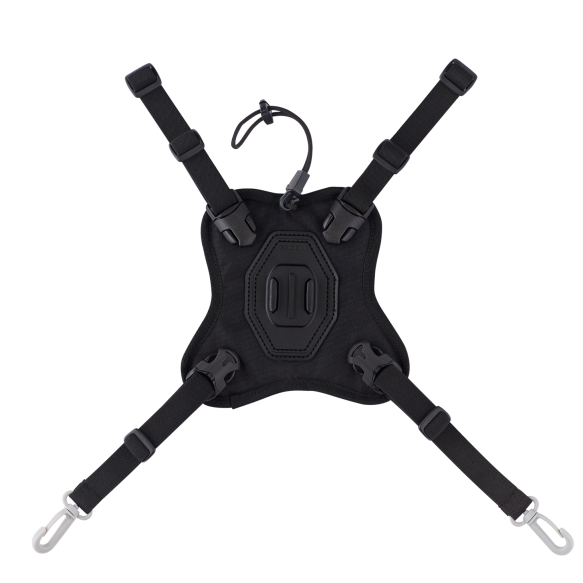 The 5-point expander can be used for mounting soft goods like a jacket or sweaty jersey. 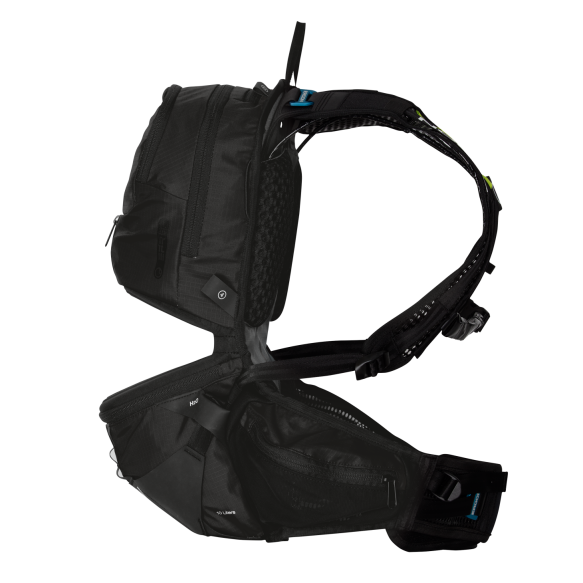 In addition there is an optional Sports Camera Chest Mount, which can be attached to the BX2 Evo via loops. Includes a rain cover in the bottom compartment. HiLumen reﬂector applications provide more safety during rides after dark. 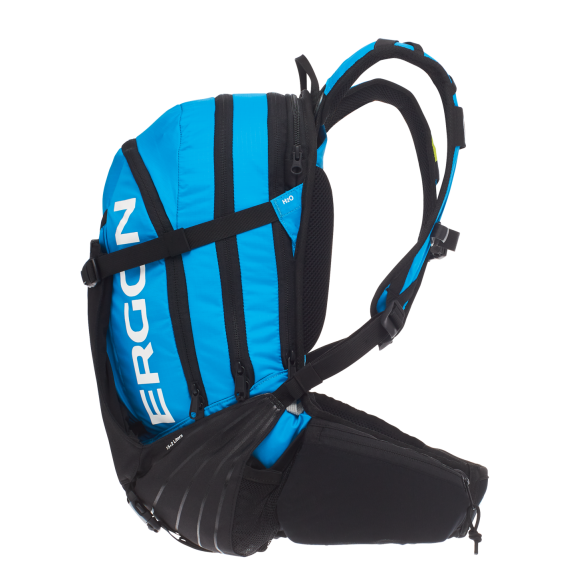 Ergon shoulder straps, featuring load compression, stabilize and support the pack weight from the bottom. With traditional shoulder straps the backpack hangs from the straps. The load being carried is unstable and moves while riding. Exact fit can be achieved through the 4-Step back adjustment. 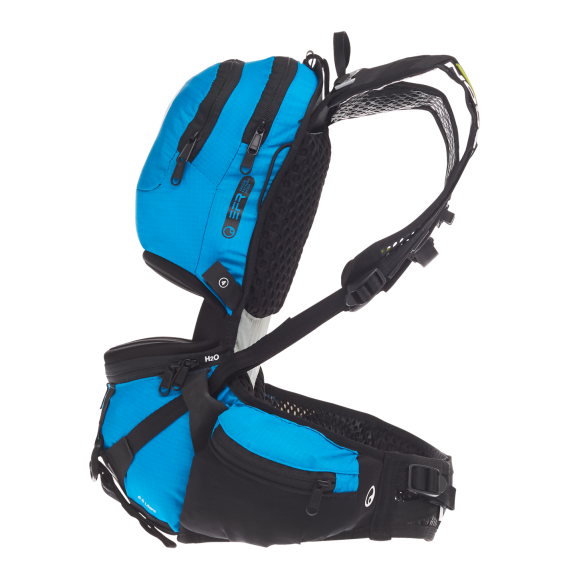 Self-adjusting shoulder straps stablize the load, which is supported at the lower back. Body-specific adjustment to form tot he rider can be made by the moldable aluminum bar. 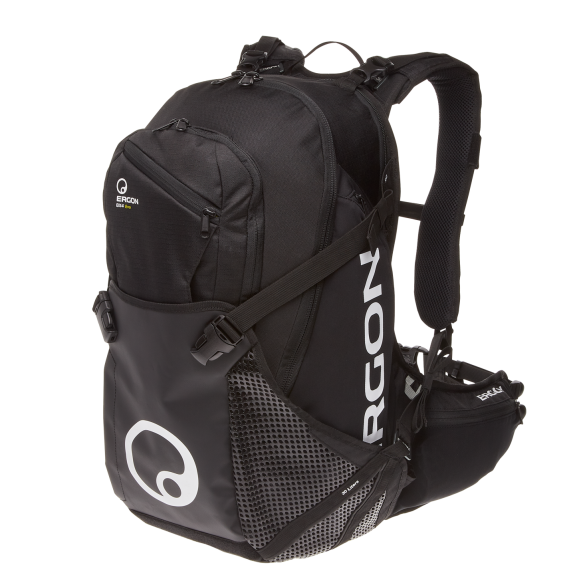 The mountain bike pack day long adventures or the daily commute. 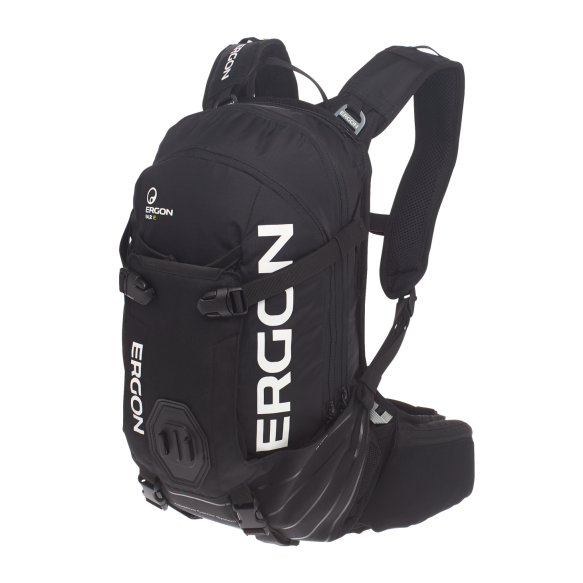 The innovative “Adaptive Carrier System” holds the load close to the body, keeping it stable. The BX3 is available in 2 sizes to fit a variety of rider sizes. 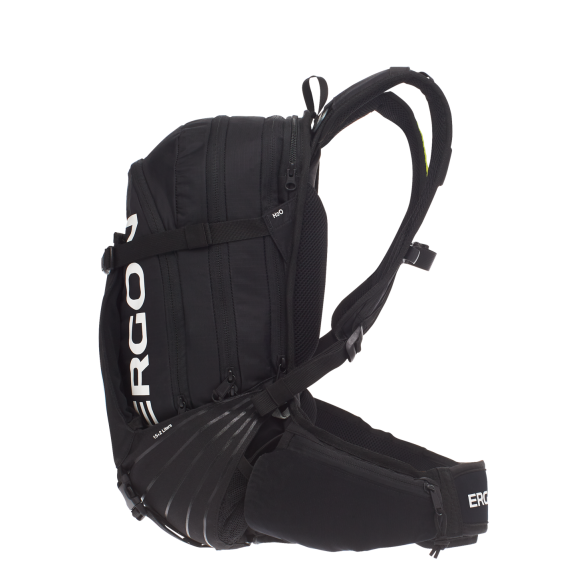 The self-correcting shoulder straps keep the pack centered on the rider‘s back. 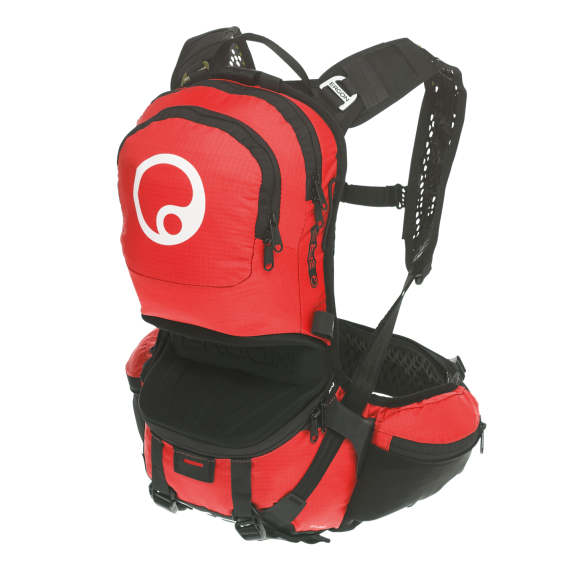 The 4 position back adjustment allows every rider to find the perfect fit and comfort. 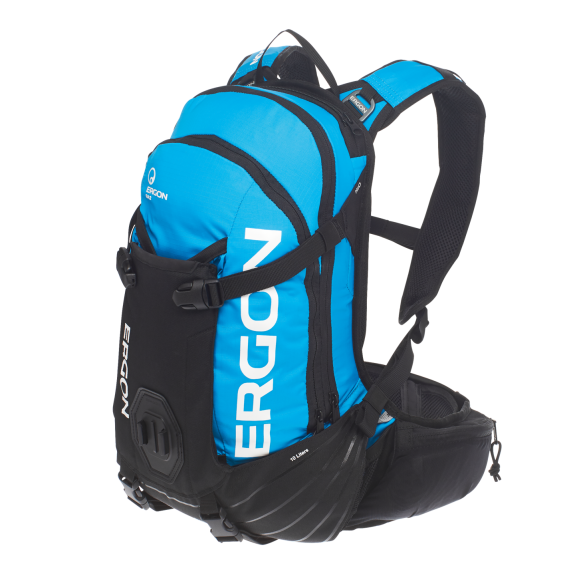 The BX3 has a capacity of 16 liters with the ability to expand to 19 liters. 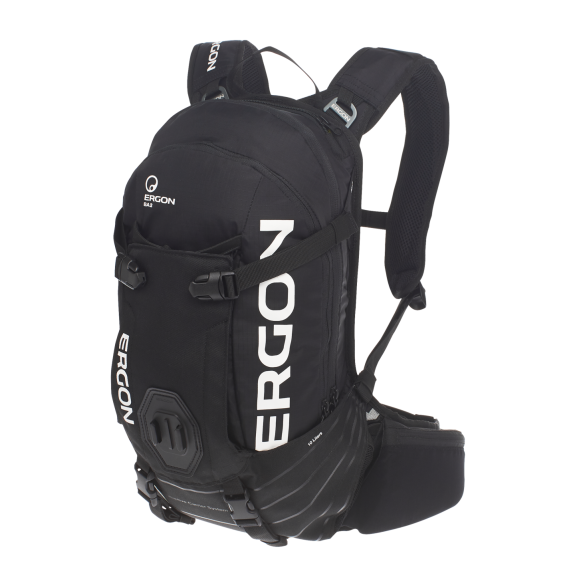 Features include a main stoarage compartment, bladder compartment, rain cover, helmet retainer, front and side pockets, and internal organization compartments. For added visibility HiLumen reflectors have been added. 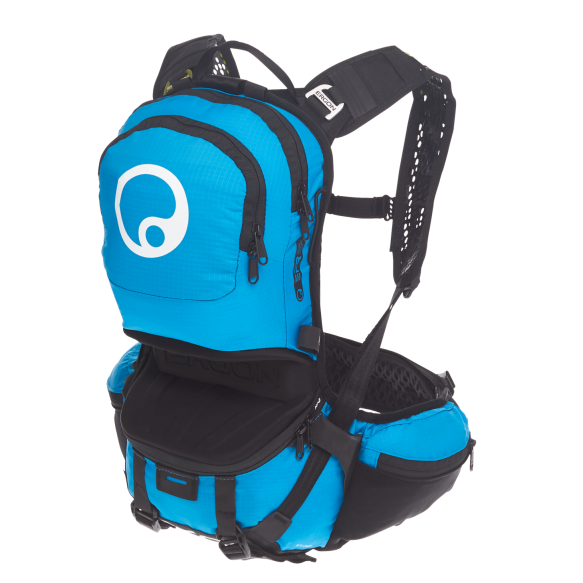 Custom fit is also important when fitting a backpack to the rider. 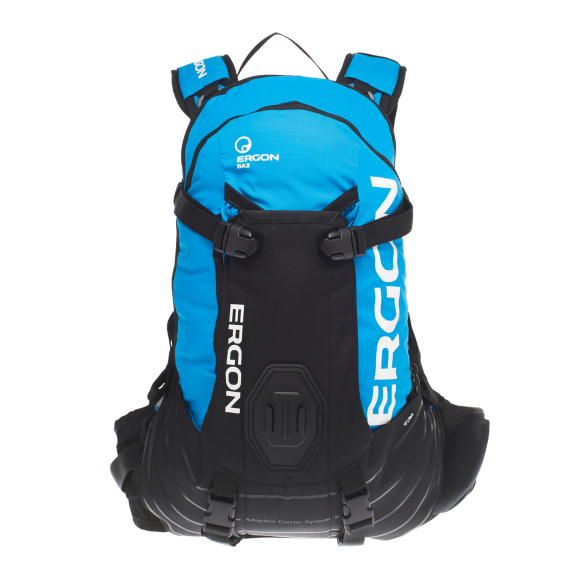 Ergon backpacks are available in two sizes to fit various rider sizes, have a four-back length adjustment, self-adjusting shoulder straps, the load-compression “Adaptive Carrier System” and a customizable aluminum lower back mold rail. 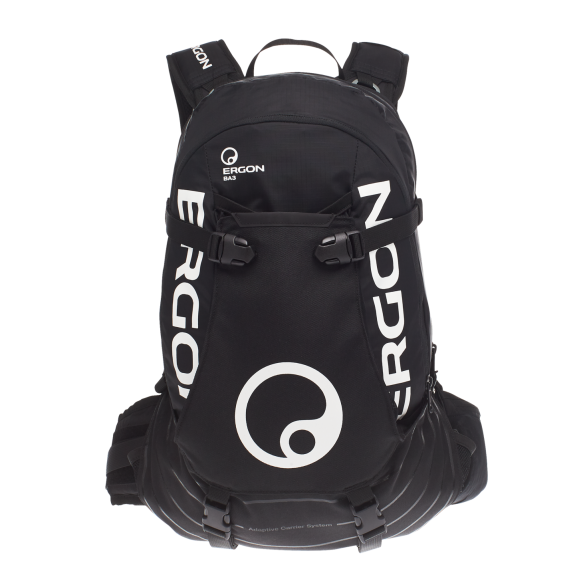 The size of the backpack is determined based on body size and clothing size. 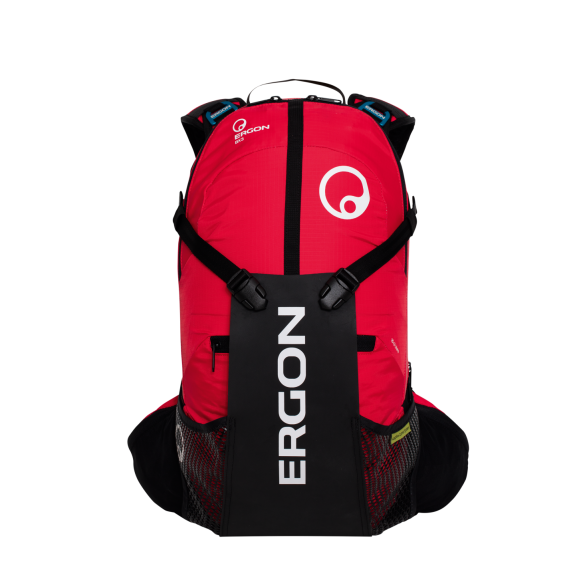 Body Height: < 175 cm/5.9" > 175 cm/5.9"
Maximum space for multi-day trips and Transalp-touring with a full 30 liters of volume. 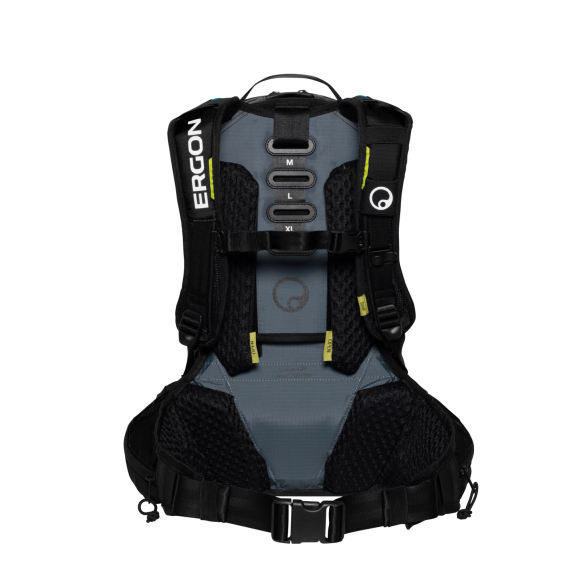 Thanks to the 5-way adjustable ﬁtting system, our „Adaptive Carrier System“ load compression principle and its „Ergonomic Pre-Shaped Fit“ (removable back panel with 3 individually formable aluminium rails), the backpack can be precisely adapted to each rider’s anatomy. 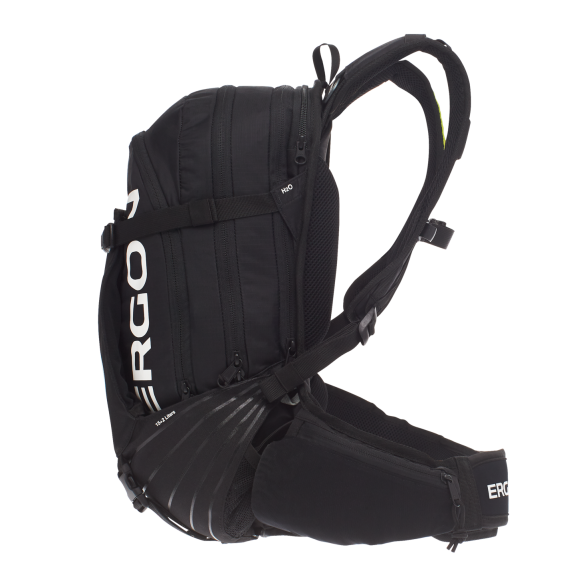 The 4-way size-adjustable (quick-adjustment via thumb loops) and a wide hip belt distribute the load comfortably and relief the shoulders. This way all your equipment is held close to the torso and can be transported wiggle-free. 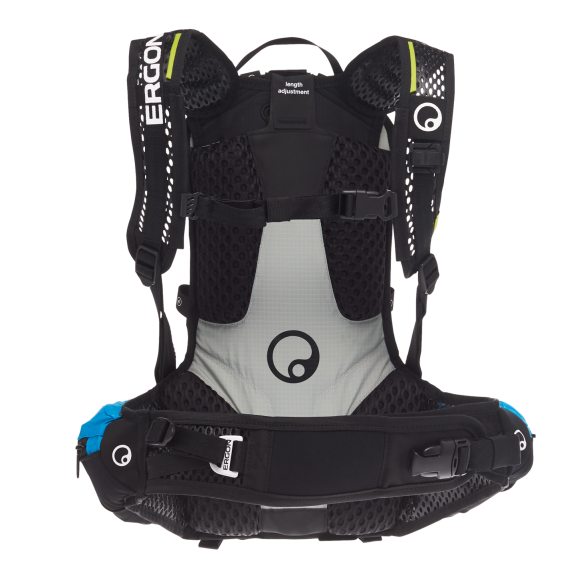 The BX4 Evo features 3D-Spacer-Mesh where contacting the body, ensuring maximum breathability. 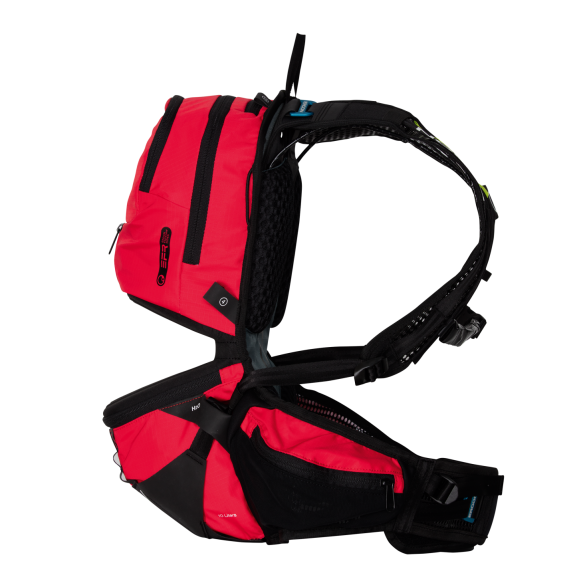 The multi-functional front ﬂap is suitable for storing a helmet, wet clothes or other equipment. When not in use, it can be tucked away nicely. 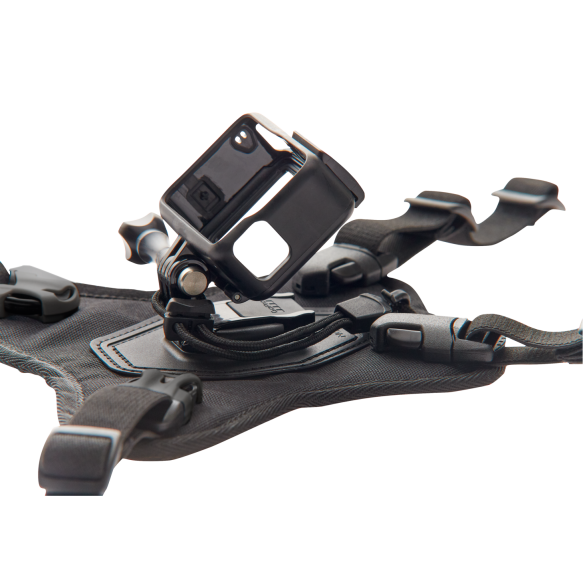 In addition there is an optional Sports Camera Chest Mount, which can be attached to the BX4 Evo via loops. Includes a rain cover in the bottom compartment. HiLumen reﬂector applications provide more safety during rides after dark. 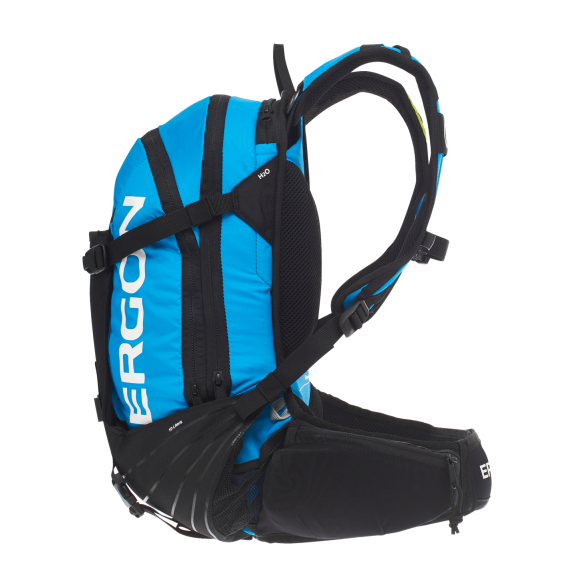 The chest mount for actions-cams can be easily attached to the carrier and hip straps of any new 2018 Ergon backpack. 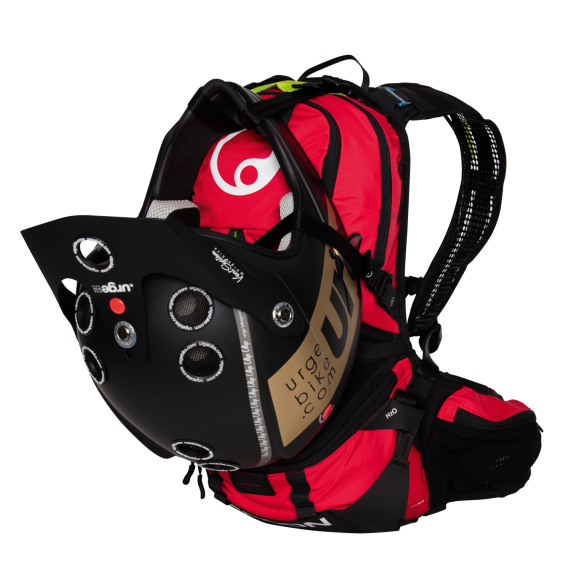 Compatible with GoPro® cameras*. For a whole new perspective and with maximum comfort. 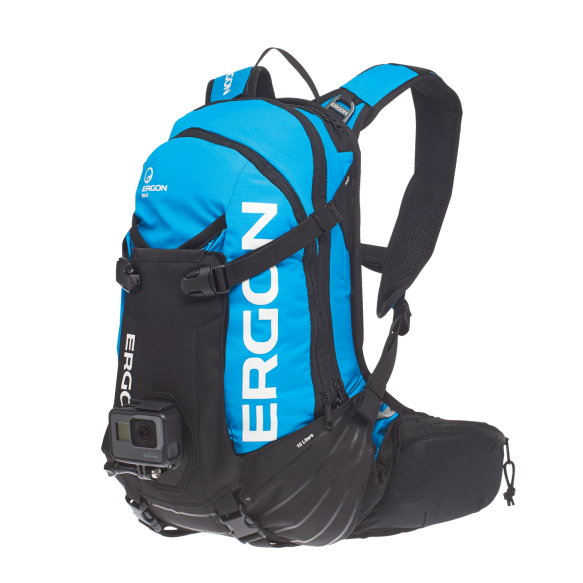 Even better: Instead of having to be strapped on using an additional harness, the camera holder can be comfortably attached via the Ergon backpack 4-point elastic clip. A hydration bladder for bike backpacks which is made of FDA approved hygienic polyurethane. The bladder can be expanded up to 8 times its size without bursting. 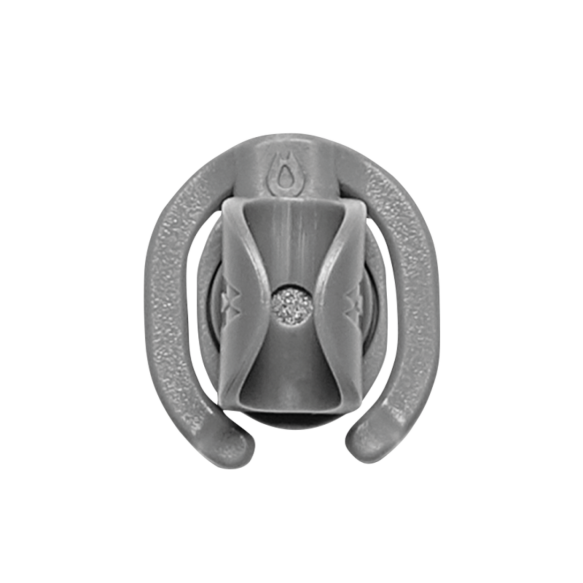 The large opening, with sliding closure, allows for easy filling and cleaning of the bladder. An extra-long, kink free, and tasteless drinking tube includes a 135º bite valve. The tube is connencted by ‘Plug n Play’ allowing for easy removal with the press of a button. A safety valve prevents leaks when tube isn’t in use. 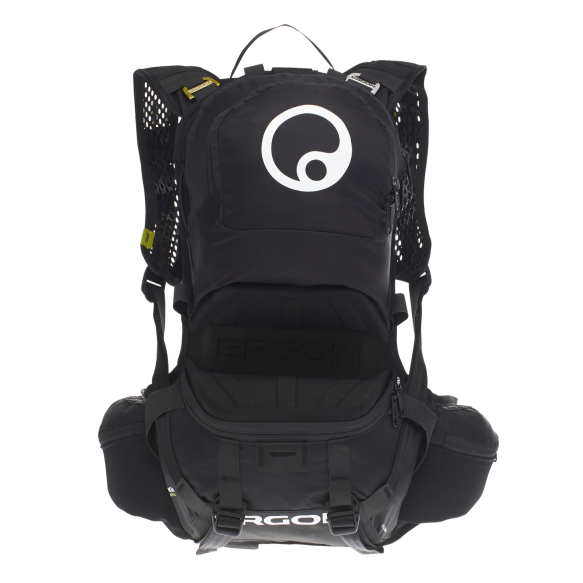 The BH300 is compatible with all normal backpacks thanks to the built in hang clip. Lightweight backpacks for mountain bikers. 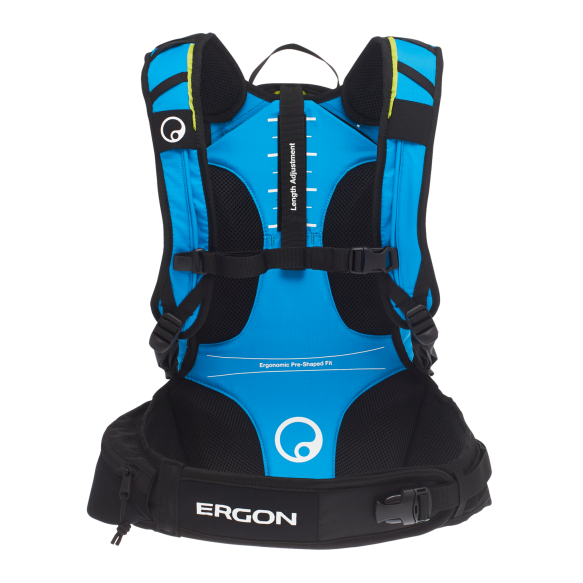 The innovative load compression ensures the carried load is always transported stable and close to the body. 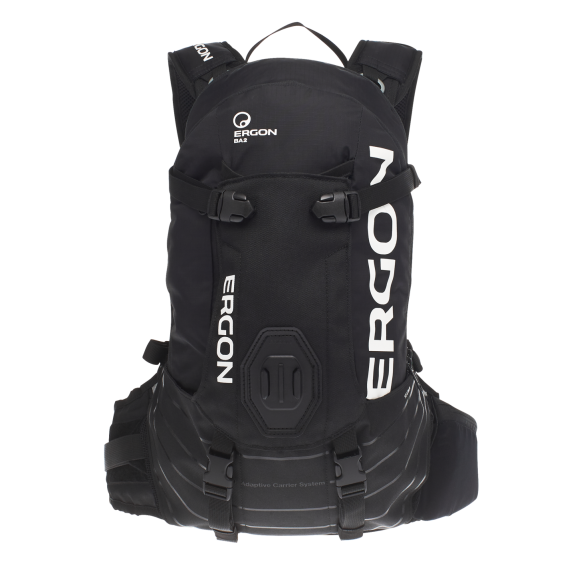 Compact All-Mountain backpack with perfect fit including a fixed mount for action cams at the back. 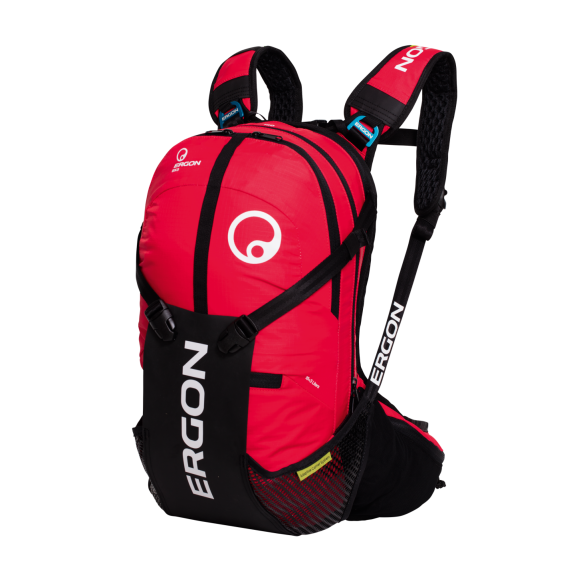 One for all – with the completely reworked 4-step adjustable carrying system, back length can easily be adjusted between sizes S and XL. 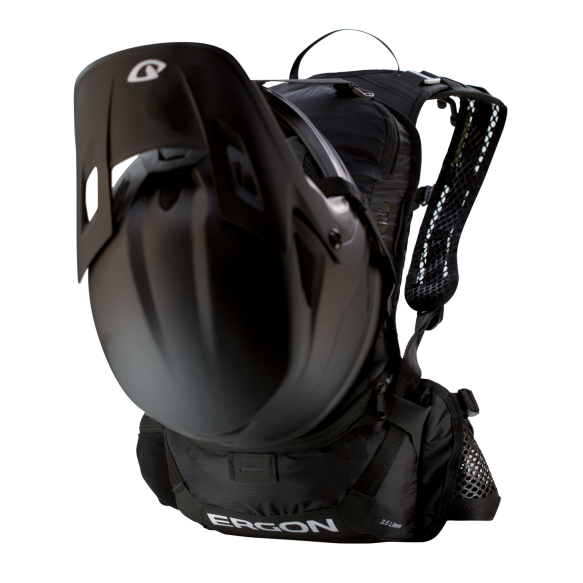 Thanks to the “Adaptive Carrier System” load compression principle and the flexible aluminium profile, the backpack can now be adapted even more accurately to the rider’s anatomy. The hip strap can be shortened as required. 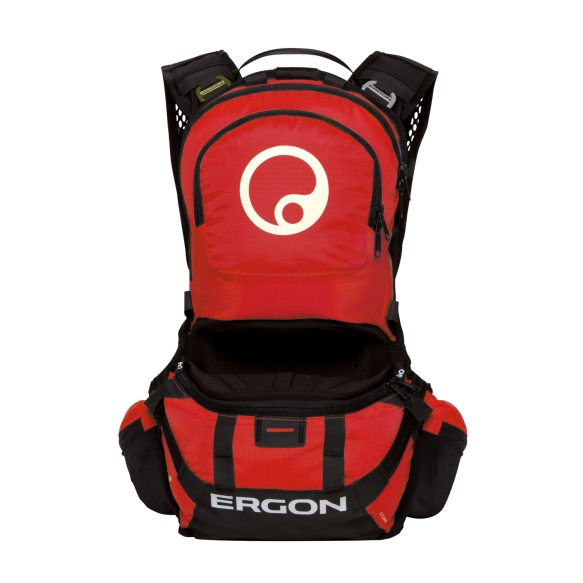 The bag contains a main compartment with 4 inner pockets, a separate bladder, a front pocket including a small compartment for tools and pumps, and a waist bag. 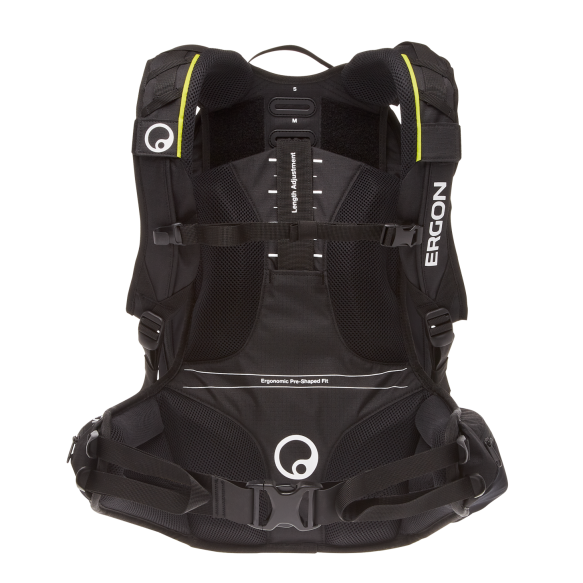 The BA2’s additional back compartment offers room for the back protector (BP100) and a bladder (BH300). 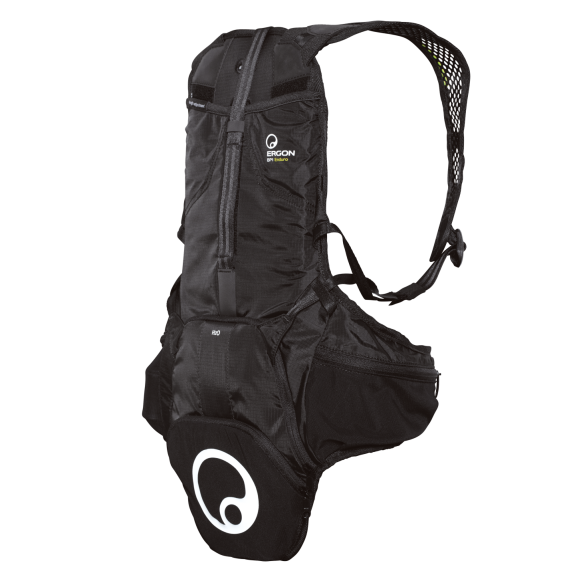 Convenient: Holder for iPhone® Drybag from Topeak® on the shoulder strap. 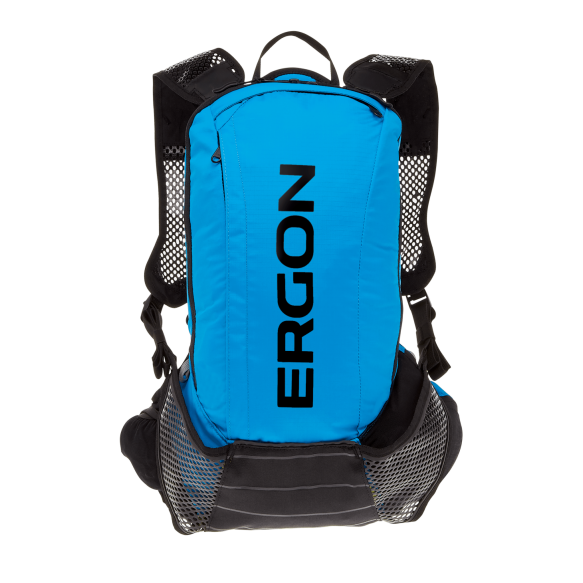 The bag contains a main compartment with 4 inner pockets, a separate bladder, a front pocket including a small compartment for tools and pumps, and a waist bag. 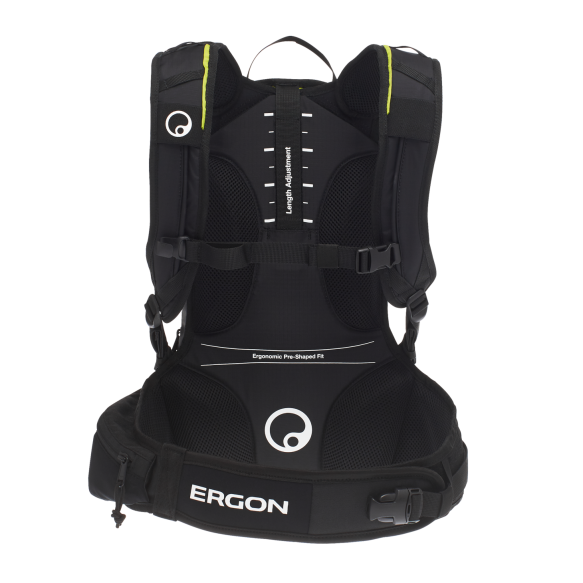 The BA2’s additional back compartment offers room for the back protector (BP100) and a bladder (BH300). 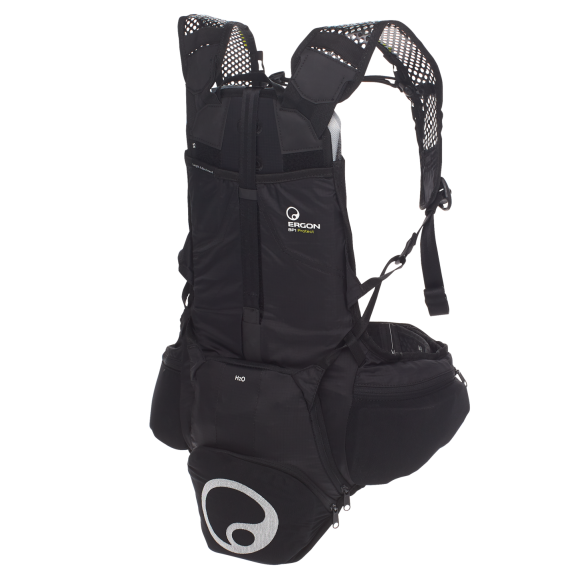 Even when carrying the battery in the BA2 E, the protector compartment still has enough room to accommodate the BP100 and the BH150 bladder. 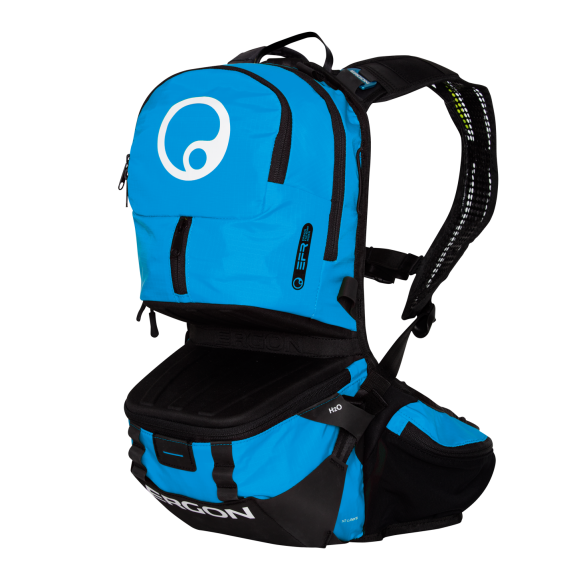 Convenient: Holder for iPhone® Drybag from Topeak® on the shoulder strap. 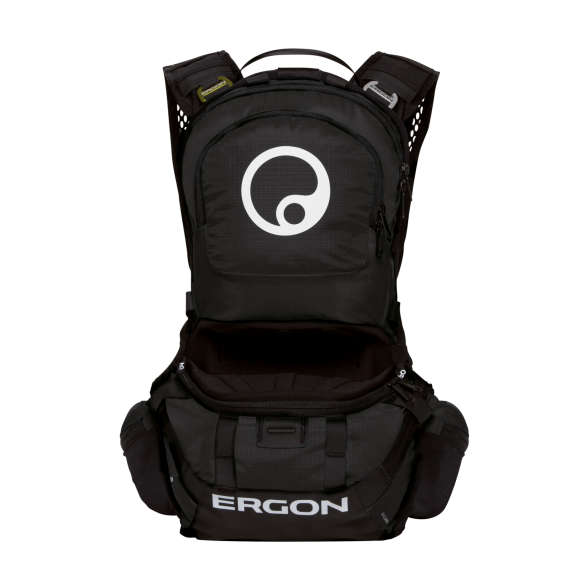 This update of the best-selling Ergon backpack is now even more user-friendly. 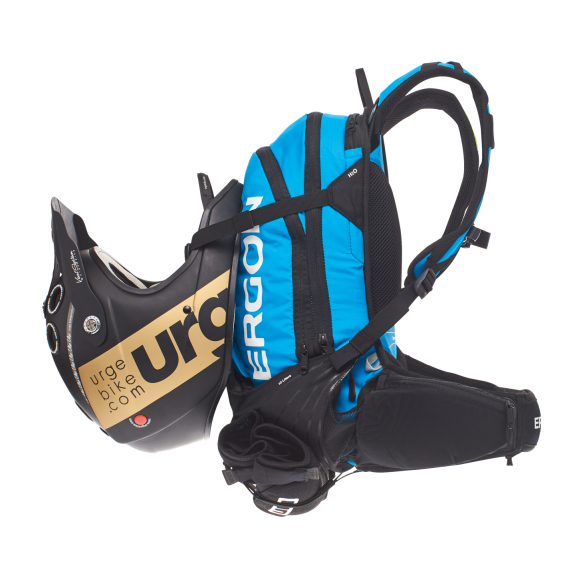 Developed for Enduro and All-Mountain use. 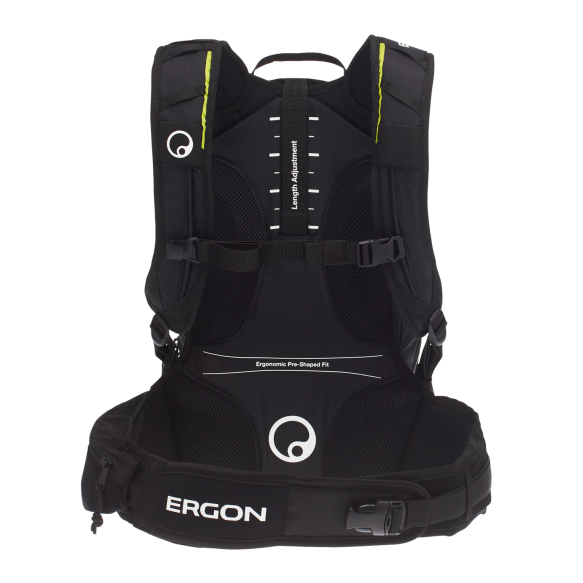 One for all – with the completely reworked 4-step adjustable carrying system, back length can easily be adjusted between sizes S and XL. 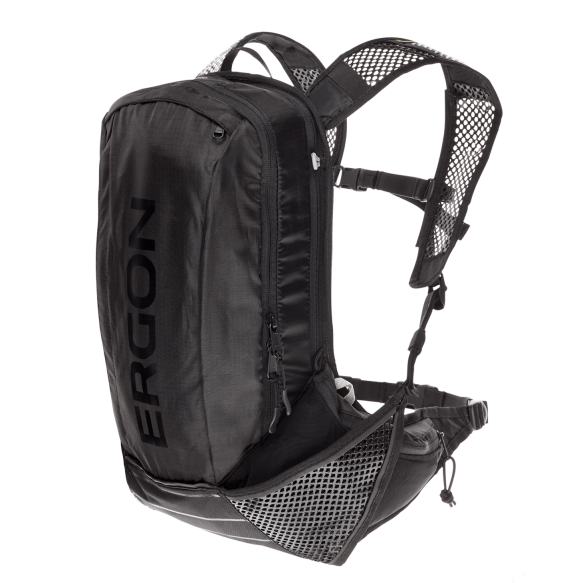 Thanks to the “Adaptive Carrier System” load compression principle and the flexible aluminium profile the backpack can now be adapted even more accurately to the rider’s anatomy. The hip strap can be shortened as required. 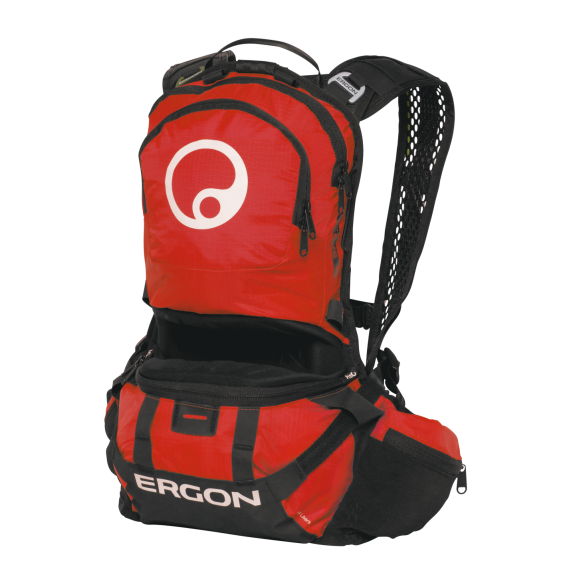 The bag contains a main compartment with 4 inner pockets, a separate bladder, a front pocket including a small compartment for tools and pumps, and a waist bag. 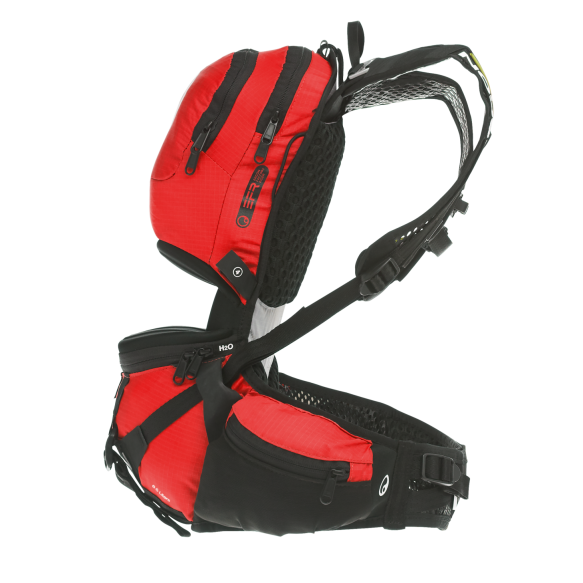 The BA3’s additional back compartment offers room for the back protector (BP100) and a bladder (BH300). 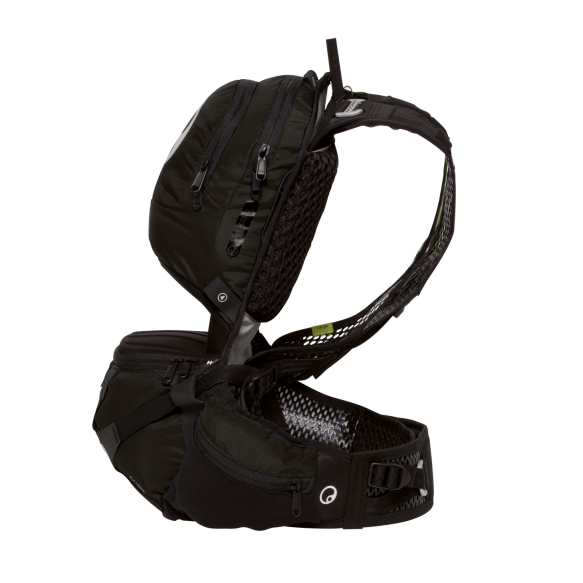 Even when carrying the battery in the BA3 E, the protector compartment still has enough room to accommodate the BP100 and the BH150 bladder. 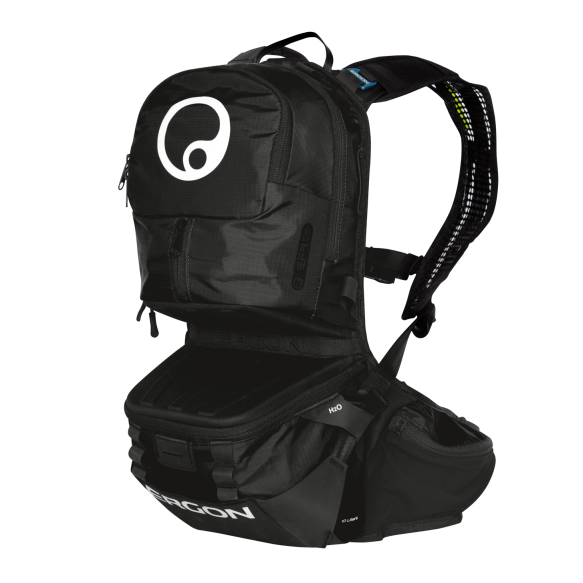 A horizontal bladder for the BE backpack series. 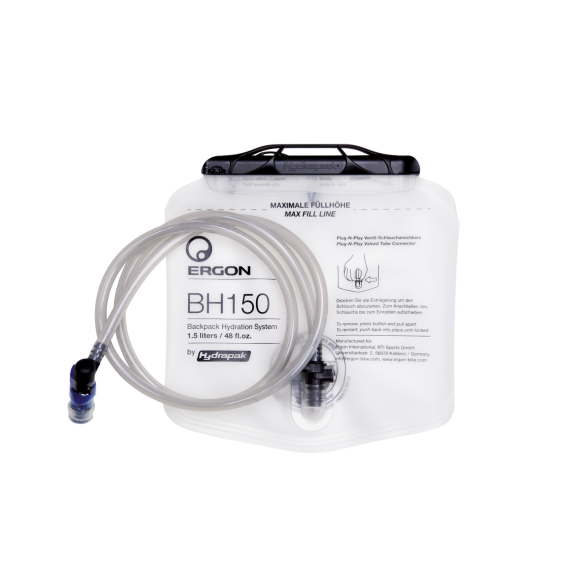 Made of FDA approved hygienic polyurethane, the BH200 was developed and manufactured in cooperation with HydraPak. The large opening with sliding closure makes for easy filling and cleaning. An extra-long, kink free, and tasteless drinking tube includes a 135º bite valve. The tube is connencted by ‘Plug n Play’ allowing for easy removal with the press of a button. A safety valve prevents leaks when tube isn’t in use. 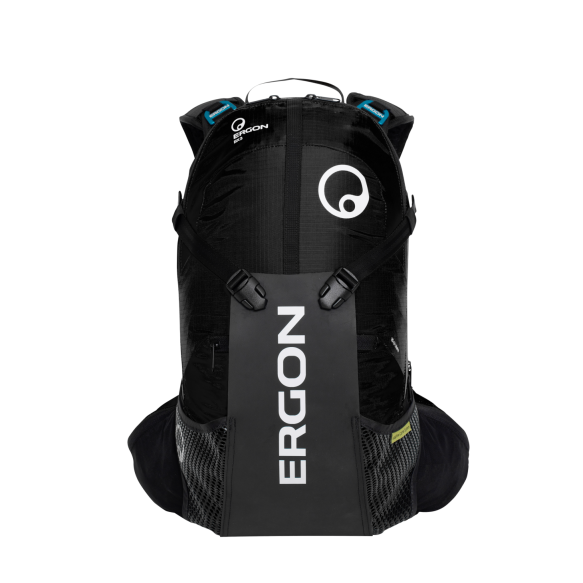 Die BH 150 liegt im Rucksack schön tief, ist bestens zu reinigen da komplett wendbar, ist sehr leicht, querliegende Form. 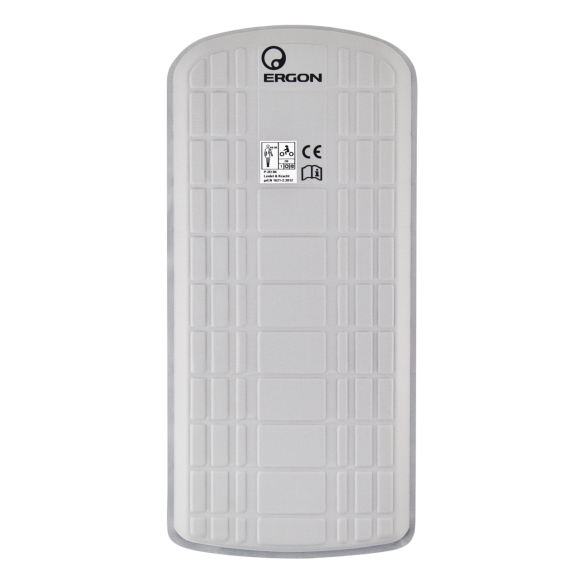 At only 140 grams, the BP100 is an ultra-lightweight back protector (140g) suitable for use in all Ergon backpacks, as well as backpacks from other manufacturers. 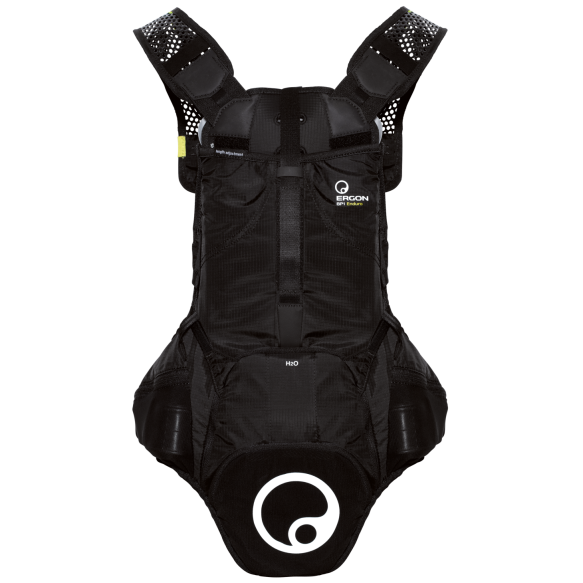 The protector helps reduce the risk of injuries in the back area. 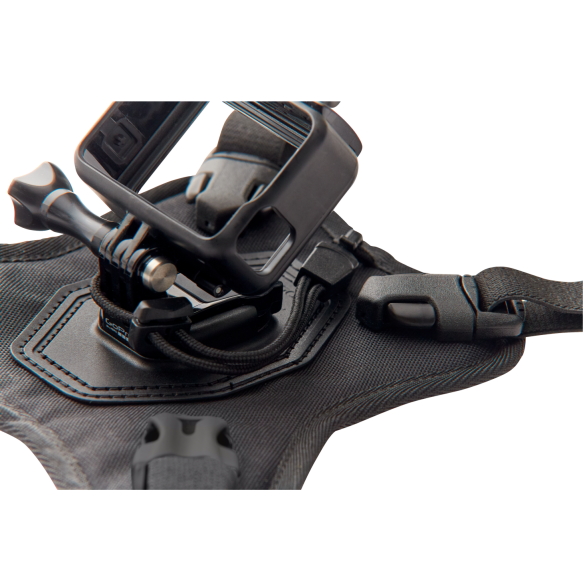 Due to its compact design and flexibility, the protector still allows for rapid movement changes. 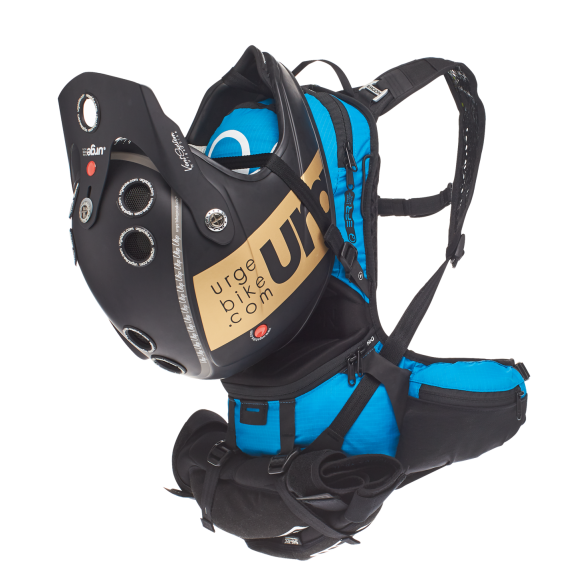 The BP100 self-adjusts to the bodies shape. The 3-layer-construction is made from foam-concealed EPS which is developed, produced, and certified in Germany. CE EN 1621-2 (Level 1) safety certified. 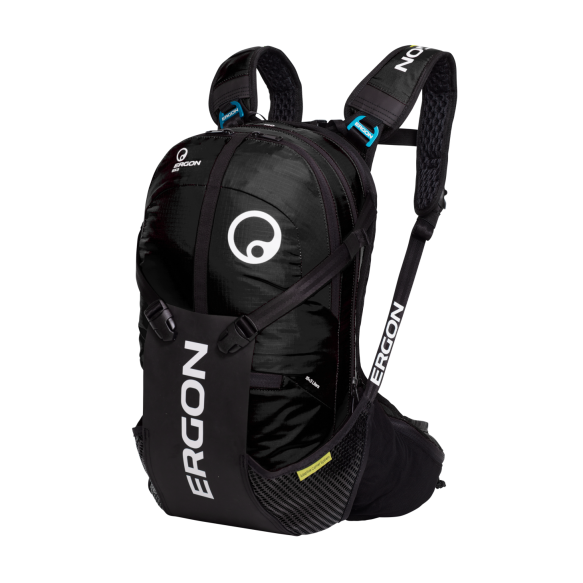 Made for All-Mountain and E-MTB use. 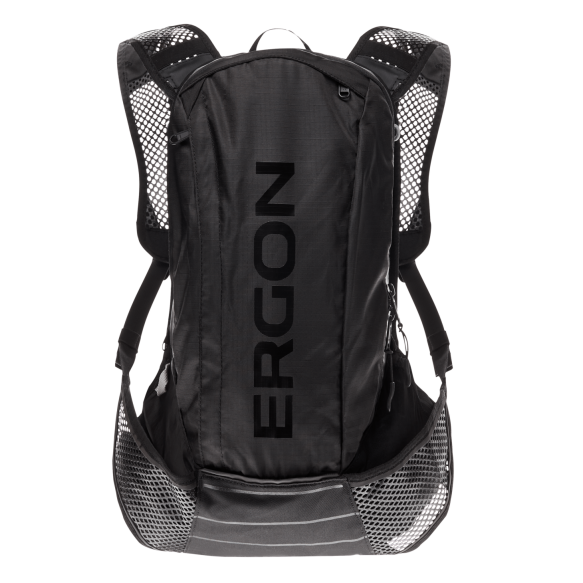 Thanks to the 4-stage adjustable back, load compression “Adaptive Carrier System”, and the flexible aluminum bar, the backpacks custom adjusts to the body shape of the rider. Less Risk, More Fun! The BP1 Protect is not only perfect for gravity racing but also great for bikepark use. 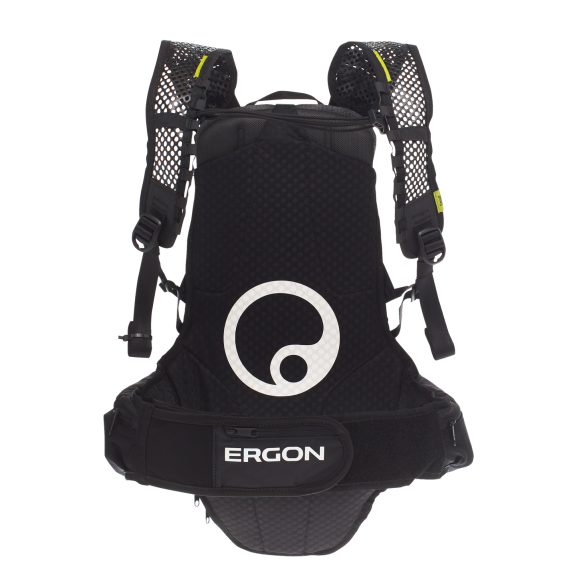 The heart and soul of the BP1 Protect is the BP100 pack protector, which is also produced by Ergon. 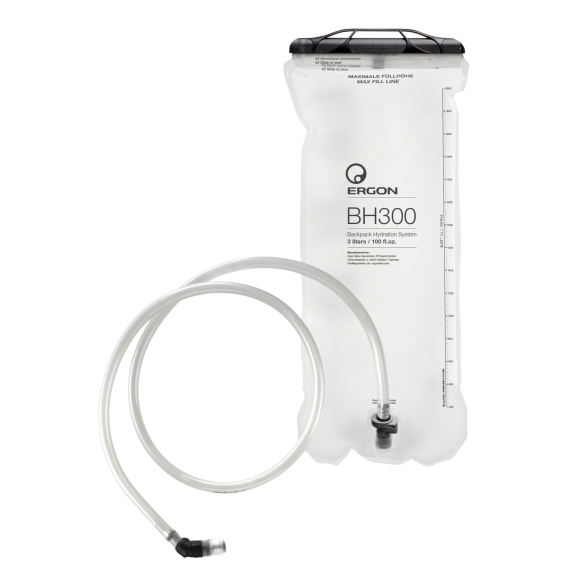 The BP1 Protect combines effective protection with usefull storage space for items such as a mini-tool, spare tube, and the Ergon BH150 (1.5 Liter) bladder. 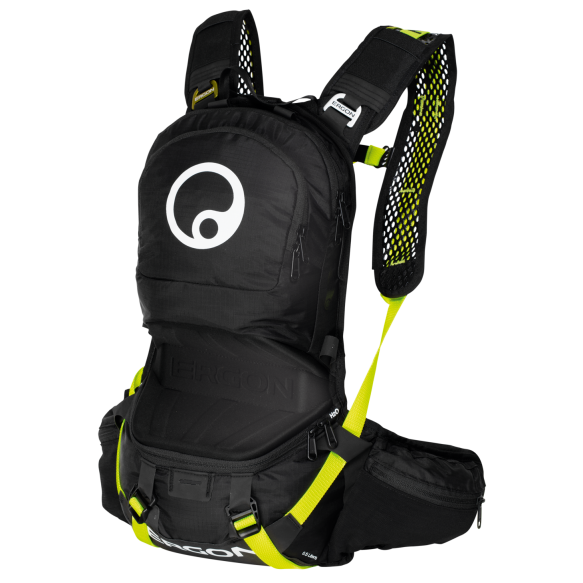 The BP1 Protect offers a revolutionary fit to the rider thanks to the self-adjusting shoulder straps. 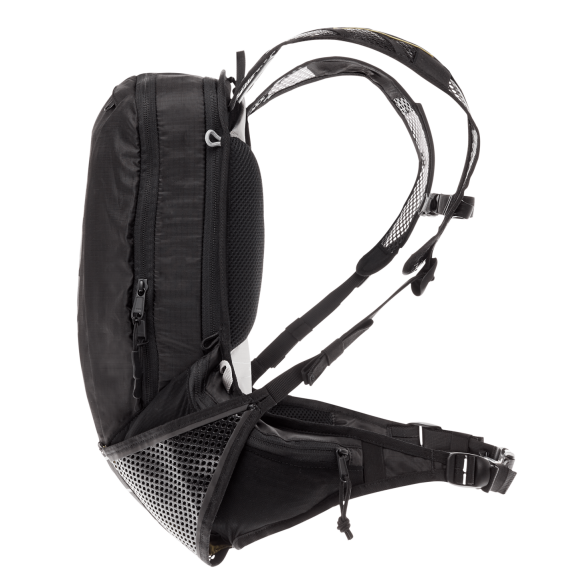 The 5-Position back length and elastic chest strap provide unlimited adjustment. 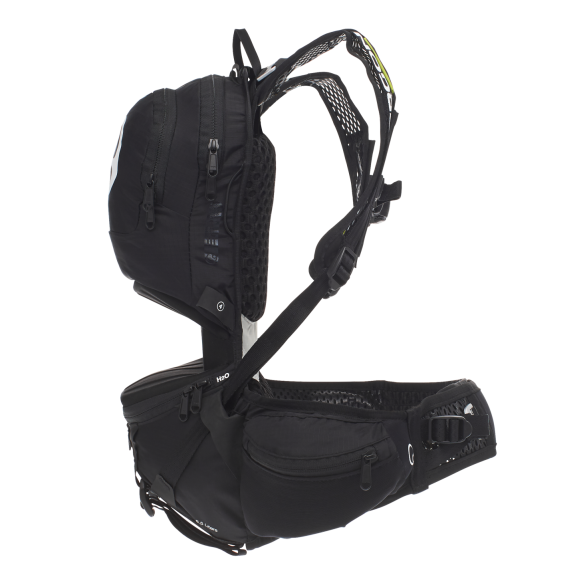 Instead of a traditional waistbelt, the BP1 Protect has a short-cut waist belt so it can be worn higher, which also makes this a suitable pack for smaller riders. Depending on preference, it can also be under the jersey for a unnoticeable appearance. This Product is not available in the US and Canada. 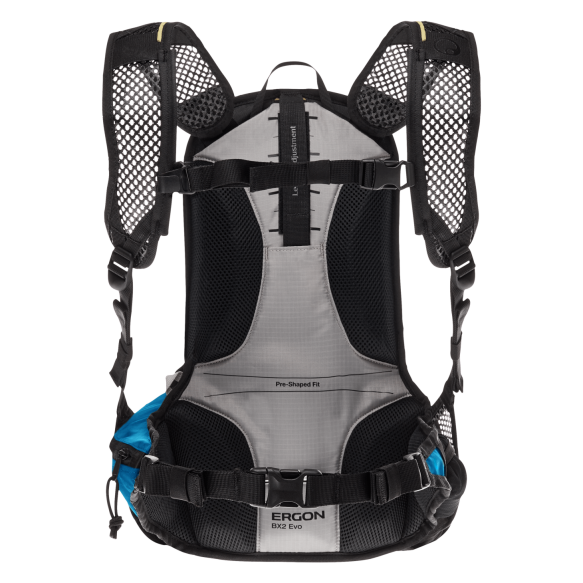 The compact hydration system has a horizontal design. 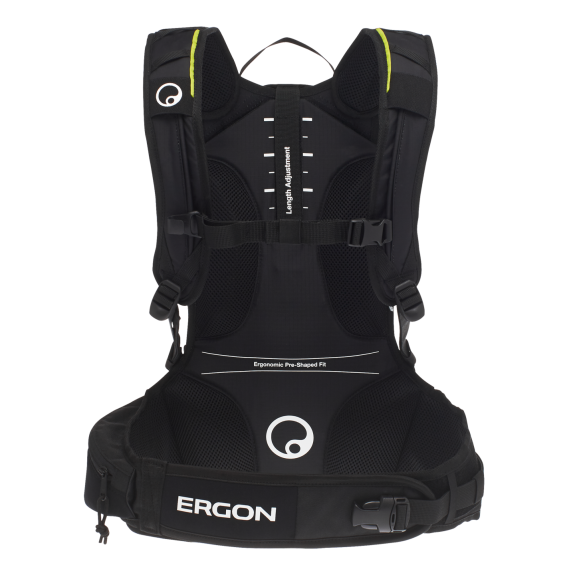 This allows for a very stable connection to the lower back and optimum weight distribution. 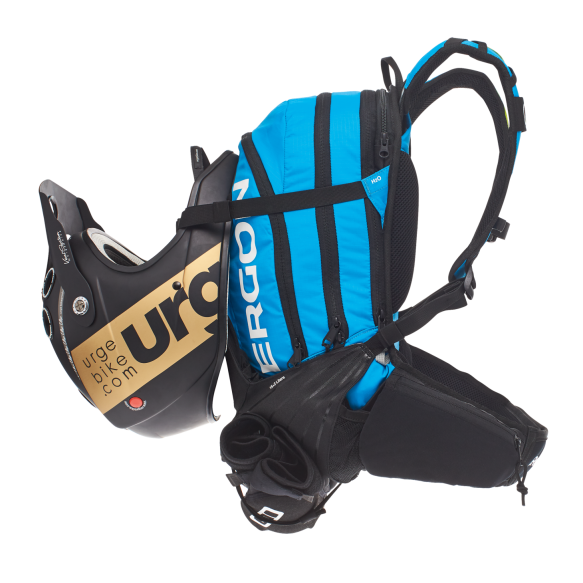 Body Height: < 180 cm/5.11" > 180 cm/5.11"
Magnetic mounting of the drinking tube to the shoulder strap for use on top of the jersey or underneath it. The Protector Pack is nearly invisible under the jersey and provides ample storage space. Perfect for bikepark use. 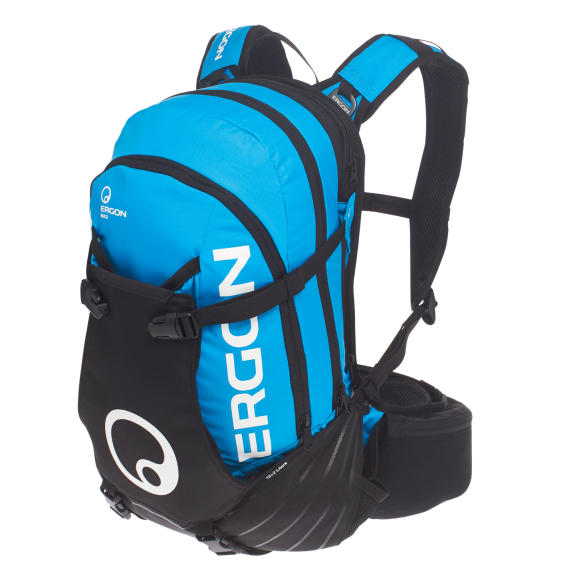 The BE2 is a highly compact 6.5 liter race pack for all Enduro and Gravity disciplines. Customize the perfect fit by using the 4-step back fitting, self-adjusting shoulder straps, and elastic hip-belt with single hand adjustment. 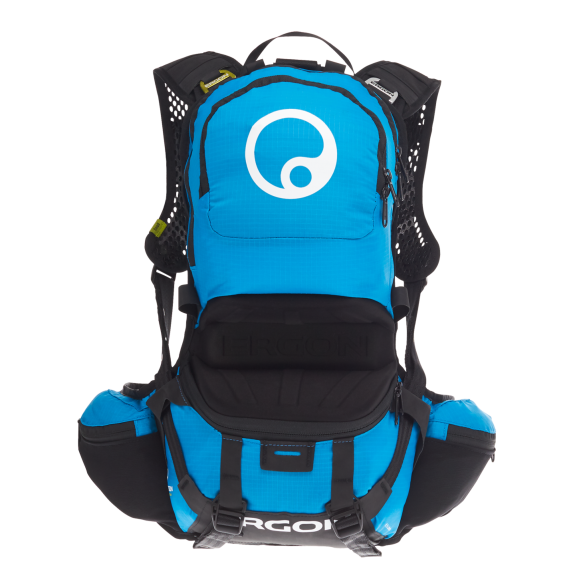 The pack is available in two sizes to fit a variety of rider sizes. 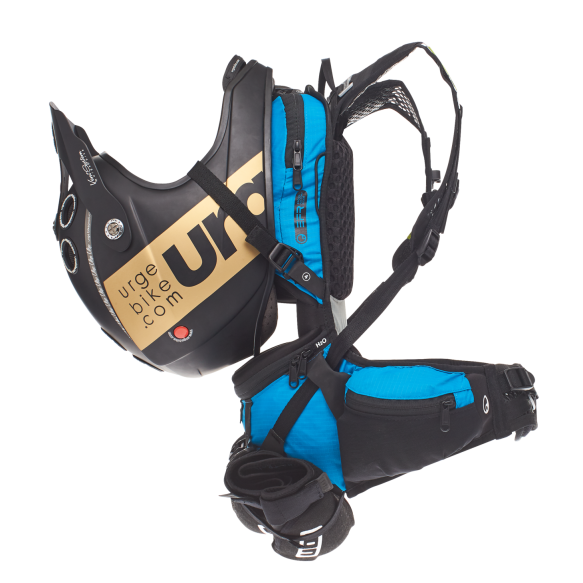 Two extra straps are located underneath the hydration compartment for carrying of knee protectors. 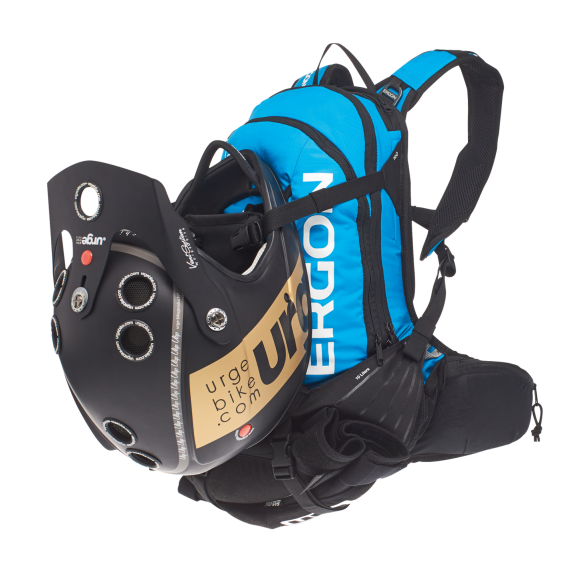 A flexible lightweight formed foam middle section, acts as the base for the backpack, makes it possible to safely carry a full face helmet. 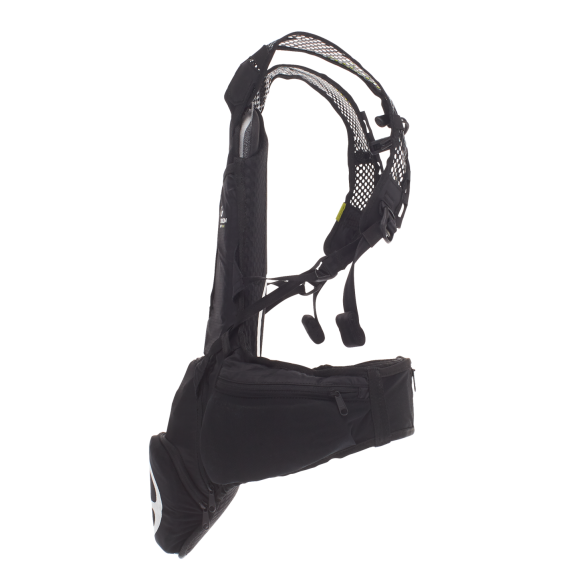 A horizontal hydration bladder sits at the waist for a lower center of gravity. 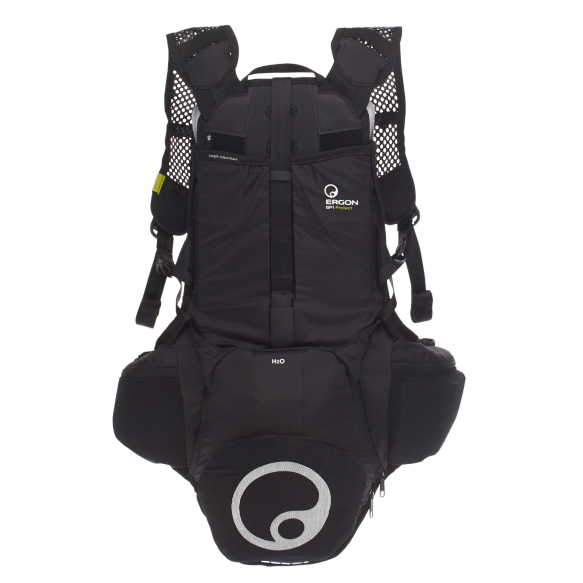 The BE2 is superlight weighing in at 35.6 oz (1010 g) (Size S) / 36.3 oz (1030 g) (Size L). 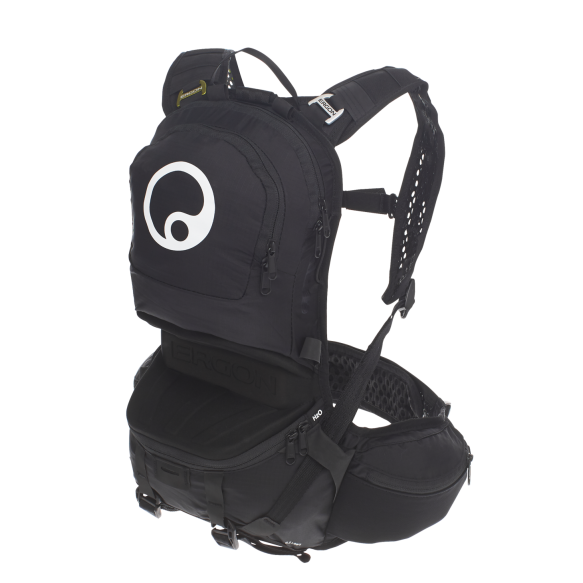 The BH150 bladder is included and a compartment exists for the addition of the BP100 back protector (not included). Exact fit is achieved through the 4-Step back adjustment. 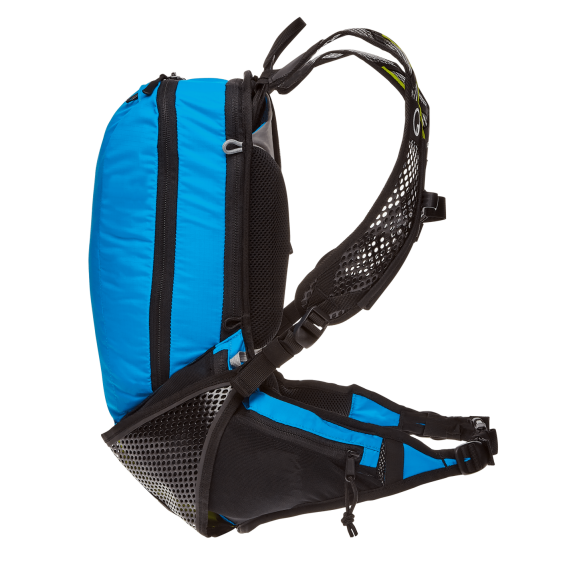 Self-adjusting shoulder straps keep the pack centered and stabilize the load connection on the lower back. 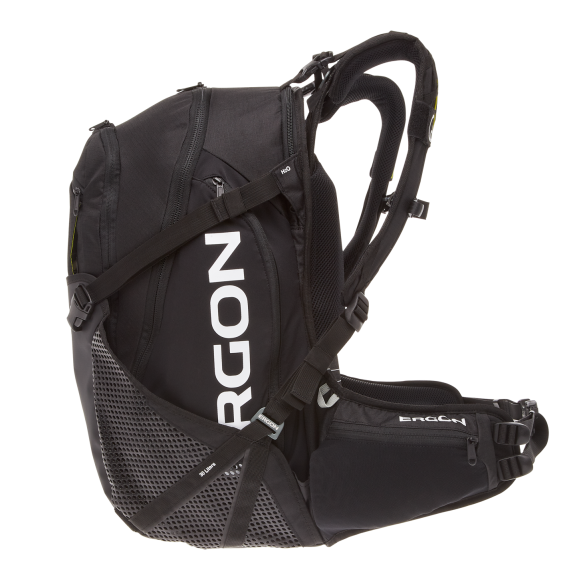 The compact hydration system has a horizontal design. 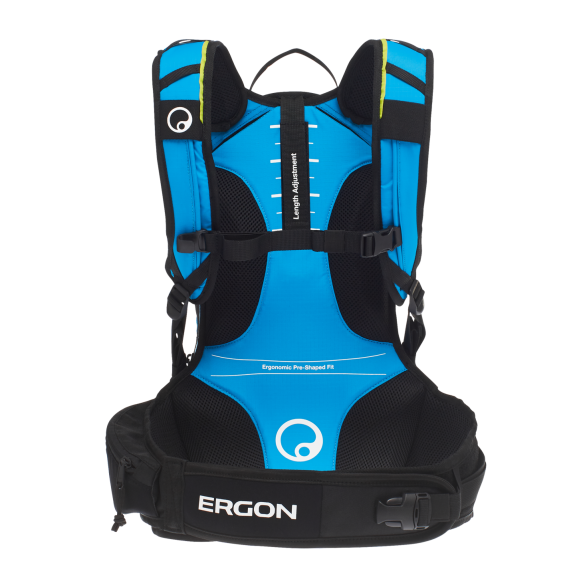 This allows for a very stable connection to the lower back and optimum weight distribution. 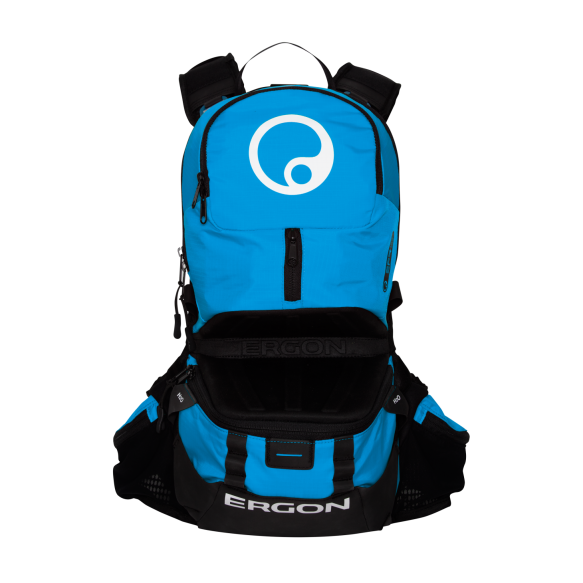 The horizontal design can be found on the Ergon BE Enduro backpacks. 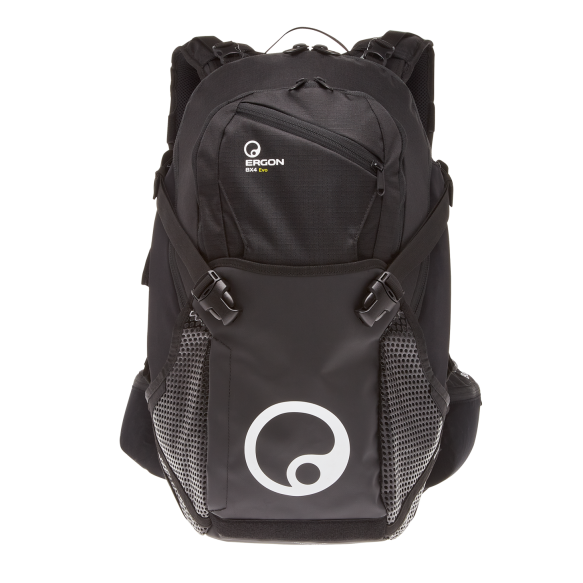 The popular BE backpack system bred for all-day adventures! 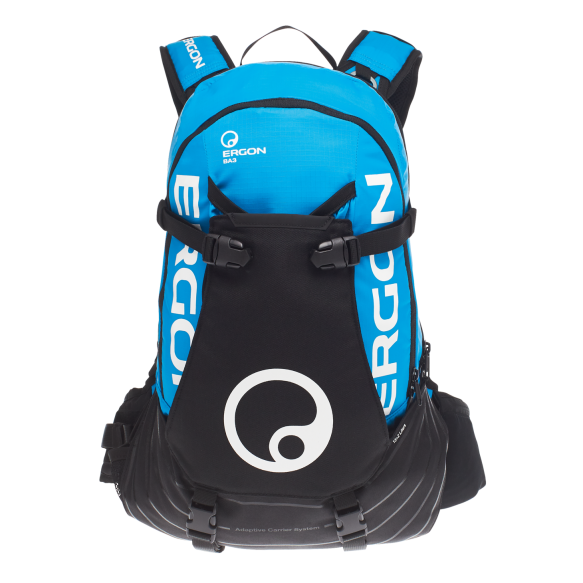 At 10 liters, the BE3 is perfect to carry protection equipment, provisions, tools, rain jacket, and other supplies. Customize the perfect fit by using the 4-step back fitting, self-adjusting shoulder straps, and elastic hip-belt with single hand adjustment. 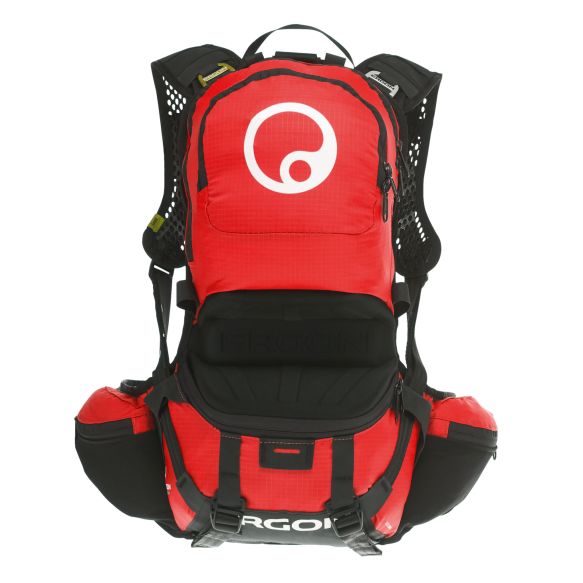 The pack is available in two sizes to fit a variety of rider sizes. 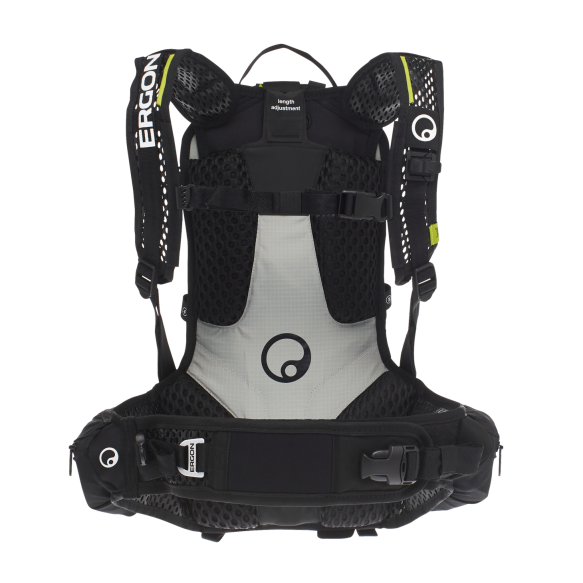 Two extra straps are located underneath the hydration compartment for carrying knee protectors. 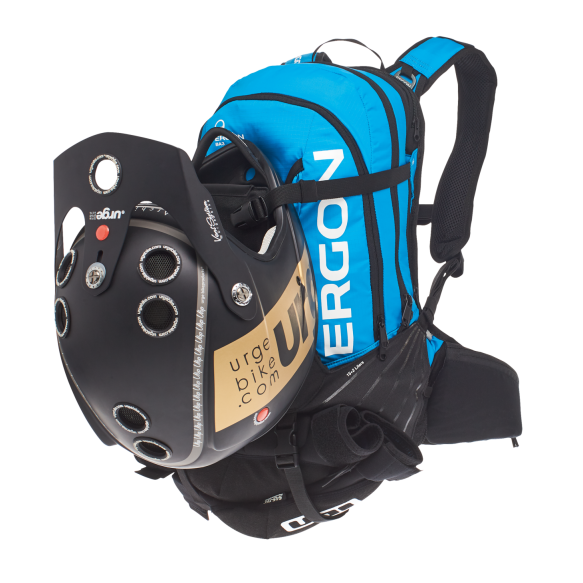 A flexible lightweight formed foam middle section, acts as the base for the backpack, makes it possible to safely carry a full face helmet. 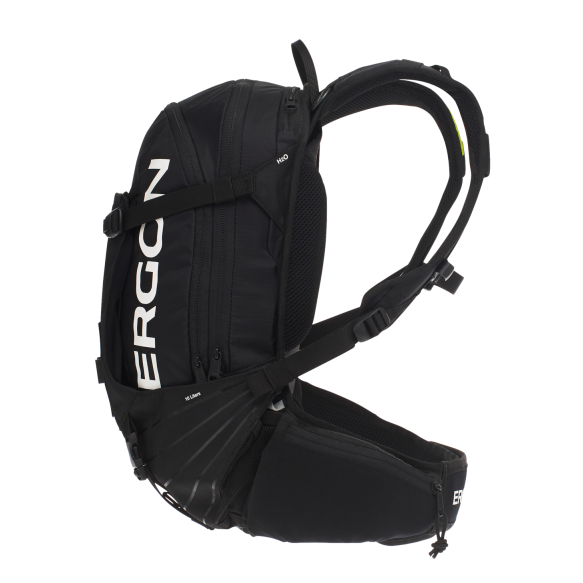 A horizontal hydration bladder sits at the waist for a lower center of gravity. 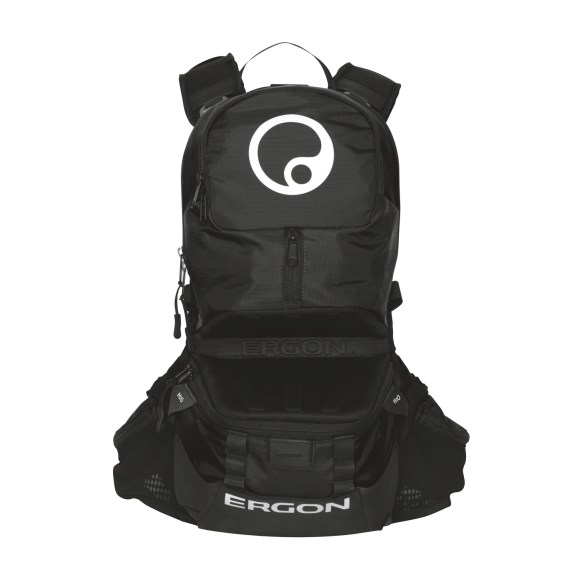 The BE3 is superlight weighing in at 44.4 oz (1260 g) (Size S) / 45.1 oz (1280 g) (Size L). 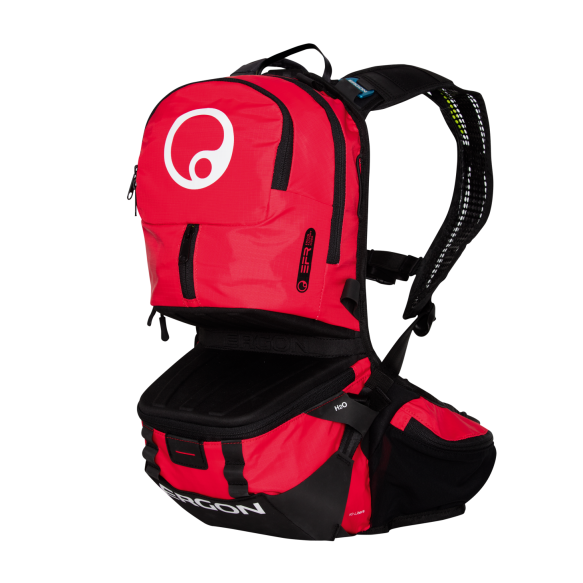 The BH150 bladder is included and a compartment exists for the addition of the BP100 back protector (not included). 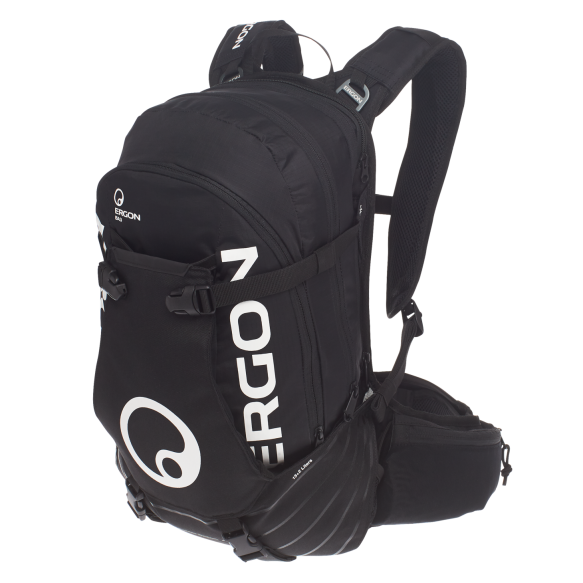 A horizontal bladder for the BE3 Enduro backpack. 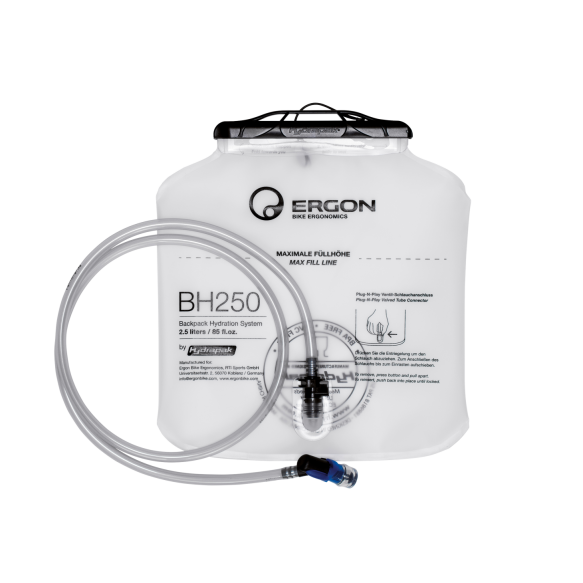 Made of FDA approved hygienic polyurethane, the BH200 was developed and manufactured in cooperation with HydraPak. 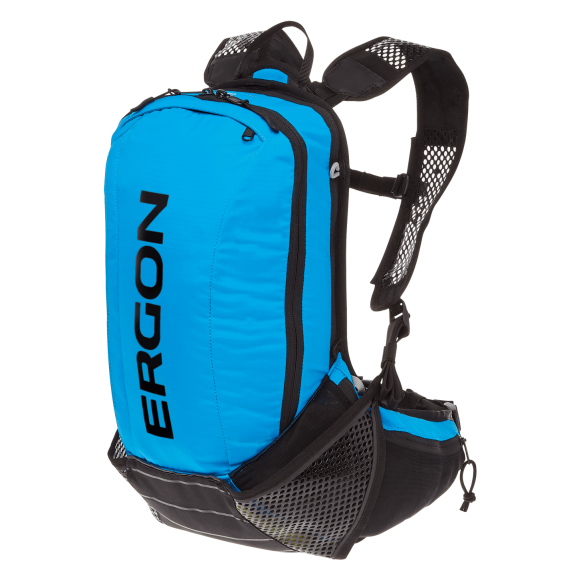 The large opening with sliding closure makes for easy filling and cleaning. An extra-long, kink free, and tasteless drinking tube includes a 135º bite valve. The tube is connencted by ‘Plug n Play’ allowing for easy removal with the press of a button. A safety valve prevents leaks when tube isn’t in use. 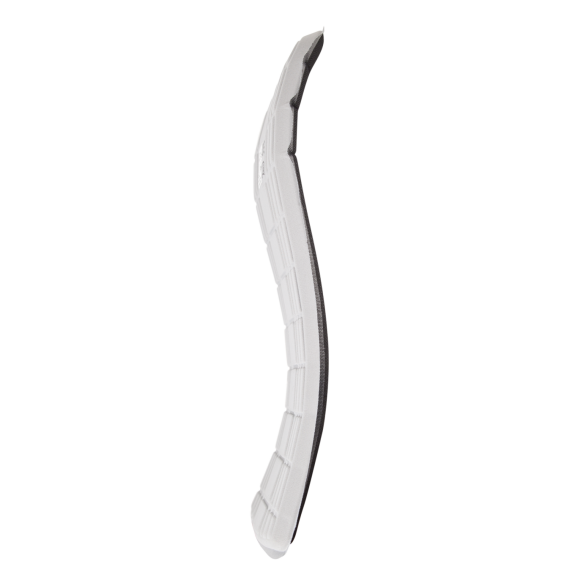 Incredible flexibility in the length of the pack made of lightweight structural foam molding. 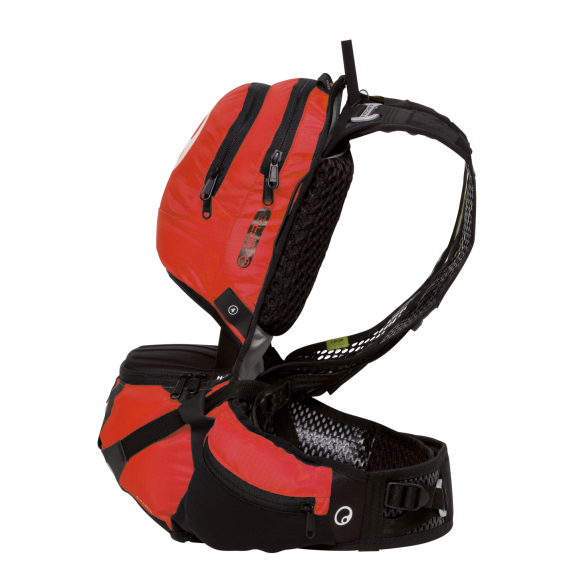 This serves as a stable base for the packing compartment and simultaneously creates space for securing the storage of a full-face helmet.